There is real concern these days that many people who were planning on retiring will have to postpone that idea for a few more years or perhaps indefinitely. That brings up a whole host of problems that will probably show up in unexpected ways. For one, as these “senior” workers keep their jobs, the cost for benefits will go up – potentially costing companies more and more. More worrisome though is the fact that the jobs that were supposed to be slotted for a new crop of young workers will be unavailable. Remember, these are the spenders while the older population are considered the savers. So while this is possibly good news for the investment markets as more money may be poured into savings accounts, it may be bad news for the economy as spending is reduced. 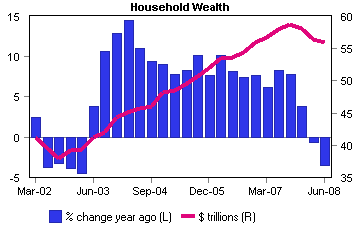 The woes from subprime financial crisis are reducing household financial wealth. The losses on household financial assets since the end of 2007 in corporate equities, mutual funds, and pension fund reserves reached $ 3.8 trillion at end of the third quarter of 2008. These dramatic losses are threatening the security of millions, particularly baby boomers who approach retirement. The retirement accounts have been hit hardest from evaporating stock market gains. According to Employee Benefit Research Institute (EBRI) testimony, around 10% of wealth stored in 401(k) plans has been lost in the first three quarters of 2008. Obviously this is not good and more problems will be noticed as the October retirement plan statements are delivered and eventually opened. In fact, it is now estimated that a total of $500 billion was lost in 401k plans thus far during 2008, but October alone may have accounted for $200+ billion.